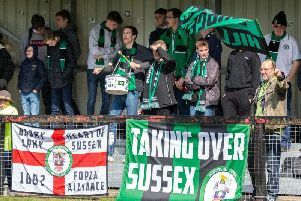 Burgess Hill Town stunned play-off-chasing Merstham with a 2-0 win. The victory means Simon Wormull's men are just one point behind Harlow Town and two behind Whitehawk as they look to pull off another great escape. Tommy Wood was the hero with goals in the 59th and 85th minutes. The club tweeted on the final whistle: "GET IN THERE!!!!!! WE WILL NOT GIVE UP!" Haywards Heath Town's play-off push hit a bump with a 3-0 defeat away at VCD Athletic. The club tweeted after: "A day where VCD were as good as Heath were poor Congrats to VCD who were worthy winners Thanks for your hospitality and good luck for the rest of the season." Hassocks lost 2-0 to Eastbourne Town.